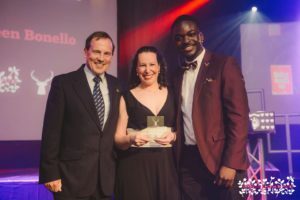 School of Arts staff and students were recipients of several major awards announced at the 2016 USSU Annual Student Awards at an evening ceremony hosted by the University of Surrey Students’ Union on Thursday 19 May. 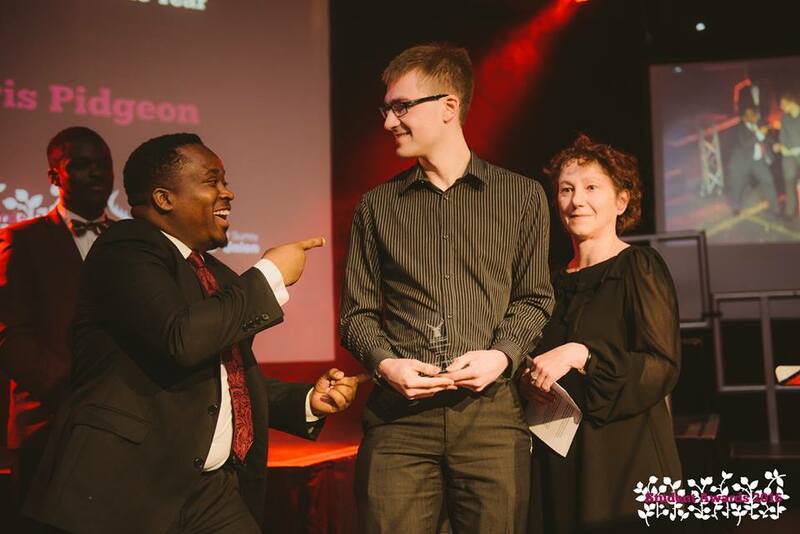 Final-year BMus Music student Christopher Pidgeon was awarded Student Course Rep of the Year. Previously in 2016, Chris received the awards of Course Rep of the Month (in January) and Longstanding Course Rep of the Year at the Course Rep Awards, in recognition of his sustained excellence in student representation. He has been particularly commended for his organisation, his proactivity in collating student opinions on a range of issues, and the outcomes he has achieved. Chris has also represented Music at every open day and applicant day throughout his three years at the University of Surrey. 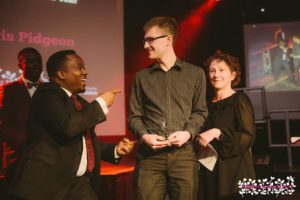 There are currently around 600 course reps across the University, so Chris’s awards reflect an exceptional achievement for which competition was extremely fierce. Associate Lecturer Dr Maureen Bonello was the winner of The Lynne Millward Award for Academic Staff Member of the Year. As Performance Co-ordinator, Maureen works tirelessly for Music students on all programmes, organising concerts both on and off campus, accompanying students on the piano (in the University Choir, Chamber Choir, and other ad hoc Ensembles, as a guest soloist with the University Orchestra, and working with solo performers), delivering performance seminars, and arranging guest-speakers. This award reflects Maureen’s outstanding, long-standing commitment to the student experience: she consistently goes above and beyond to ensure that the students have plenty of worthwhile performance opportunities, and she is a steadfast positive force who has an impact on every student in the department. Eleanor Dickens, a talented first-year BA Theatre and Performance student and member of Musical Theatre Society, received the award of Society Member of the Year. This year, Eleanor has Set Designed for and performed in Musical Theatre Society’s main show, Stephen Schwartz’s Pippin, as well as performing in both the Autumn and Summer Showcases. She has recently been elected President of the Musical Theatre Society for next year. She has also been a part of Theatre Society, Set Designing and building for their main production of Animal Farm in the Star Inn in Guildford town centre, and she has undertaken some prop-making for the new musical Elysium, currently being developed at the University of Surrey. Others from School of Arts who received nominations include Oliver Bowring, a second-year BMus Music and Sound Recording (Tonmeister) student, for the Student Media Award; and PhD Music student Alex Harden, for Course Rep of the Year, having earlier been awarded PGR Rep of the Year at the Course Rep Awards. 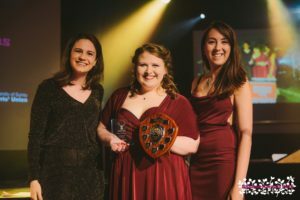 Theatre Society was shortlisted for both Most Improved Society and Fundraiser of the Year. Theatre Society’s production of Animal Farm as well as Musical Theatre Society’s production of Pippin received nominations for Student-Run Event of the Year. Providing entertainment during the evening was Ragtime Marmalade, a funky six-piece Trad Jazz band comprising Trombone, Trumpet, Clarinet, Banjo, Bass, and Kit. Its players all met through the music department at the University o f Surrey, collectively studying the full range of Music courses available here. 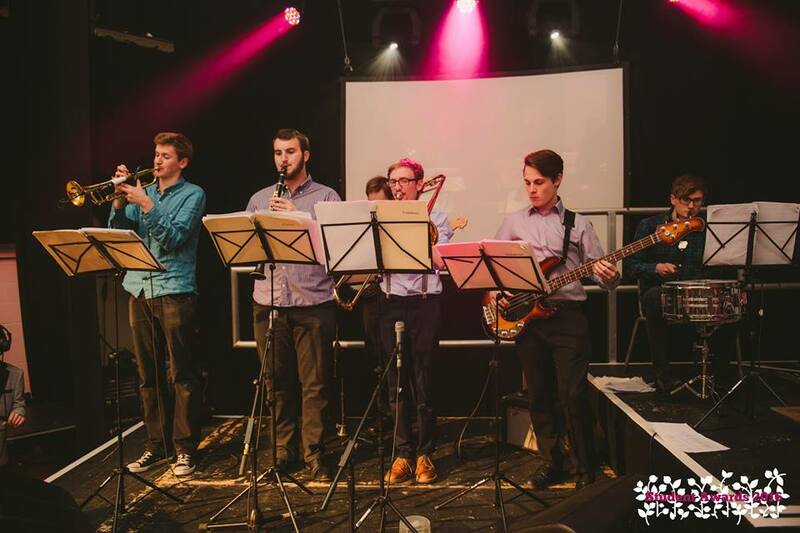 With repertoire ranging from classic jazz standards to modern pop arrangements, they have previously performed at the University Annual Review 2015 launch event, the University’s summer open days, and the premiere of Star Wars: The Force Awakens at the Odeon Guildford. They were delighted to have been chosen to play at the USSU Annual Student Awards. With thanks to Christopher Pidgeon, Eleanor Dickens, and Nick Smith (of Ragtime Marmalade) for their contributions to the above text.